This Tuesday it’s my baby-sisters birthday and i have been working on this card for quite a while now. I started to colors this like months ago in this nice purple tone. I recently found it just laying around so I deiced to make i for my sister, it’s a very fitting color and image for her. So I did the last coloring, like the hair, to suit my sister even better. The haircolor I chose I one that i think mimics the color my sister have right now. The frame for Kitty is made with nestabilities small labels and i started out with a white paper and then distressed with weathered wood. I do now own this stamp, I stamped up a couple on my copic-course in September so I have two left I think. Anyway, i did use this weeks Sketch Saturday-sketch for my layout and i tried to keep with the purple tones from the coloring. The purple papers are from Maja Design’s collection “Ska vi ta en fika?” and the gray paper is from the Little black dress collection. All the papers have been distressed with either Dust Concord or Weathered Wood. The top embellishment is a black satin ribbon that i tied some knots and the bottom one is a border made with Martha Stewart’s borderpunch Modern Garland. The butterflies are some fabric butterflies in pink and blue that I made black with a permanent marker and just stapled on. They have a bit of the shimmer of the old color which gives them a nice depth. The greeting is using some alphabet-pearls from Panduro that i glued in place with some glossy accent. The inside is made with the same paper and idea as the outside and I left a nice big space for the greeting. Other: Gelly Roll pen – White, Gold. Distress Ink – Dusty Concord, Weathered Wood. Martha Stewart – Modern Garland. 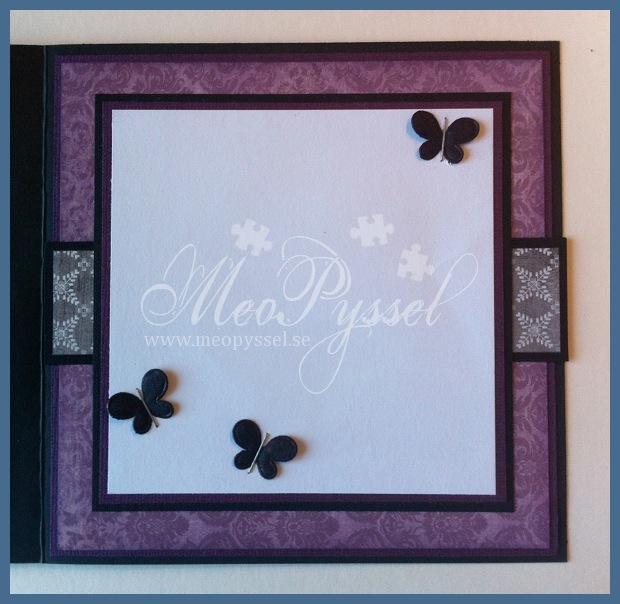 Spellbinders – nestabilities- small labels. What a gorgeous card!!! Love your beautiful colouring and the pretty papers! Thank you for joning us at KKKG challenges this week and good luck with the draw! Pretty card. I love the deep purple colors you chose as well. Thanks for joining us at the CMC Copic Challenge. Beautiful card. Love your colour combination. So gorgeous. Image so cool with amazing colouring on it. Great Job!! Fab card, thanks for joining us at Phindys Place this week…. What a fab and funky image! Thanks so much for joining us at Sweet Stampin. Wonderful card, thanks for joining us at Sketch Saturday. Fabulous card, and awesome design! I am so glad you joined us this week for the Phindy’s Place challenge. I hope you’ll join us tomorrow for our 100th challenge and a blog hop!